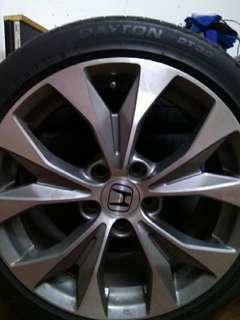 Fit in for Honda Civic, Accord, CRV, etc. which has below requirement la.. Size 17 x 7.5 Offset 45 PCD 5 x 114.3 COME WITH TYRE 215/45/17. Brand Dayton. Condition 60%, still can travel Cuti2 Malaysia.